Schedule your taxi from Podgorica airport to Ulcinj and pay only 55 Euros on arrival to your destination, using our 24h available transportation service, cheap and comfortable. Ulcinj is a town in the south of Montenegro, and for decades has been recognized as a top tourist destination. If you are traveling to Ulcinj, or Ada Bojana via Podgorica, and you need a taxi from airport Podgorica to Ulcinj or Ada Bojana, we can provide you with a perfect taxi service, by low rates. Transportation from Podgorica airport to Ulcinj – Ada Bojana is just a part of our business activity, especially pronounced during the summer months. Ulcinj city is located near the mouth of the river Bojana to the Adriatic Sea (Ada Bojana), and has the longest beach at the all Adriatic, Velika Plaza, which is 18 kilometers long. Traffic connectivity of Podgorica and Ulcinj is not at a high level, and because of that, a large number of tourist is deciding for a service taxi from Podgorica airport to Ulcinj. The most famous attractions in Ulcinj are the old town and nudist resort Ada Bojana. The old city of Ulcinj is one of the oldest cities on the Adriatic coast. It is an ancient city which is more than 25 centuries old, and the oldest parts of the city date from the Illyrian period. Transfer service by taxi from airport Podgorica to Ulcinj is not so often just because of the nice beach, there are also visitors which are coming for historical reasons. Taxi airport Podgorica to Ulcinj and Ada Bojana is inexpensive and absolutely affordable for all kind of travelers. This applies particularly to family travel, or when two or more persons are going together. So if you are planning to spend your vacation in Ulcinj and you need airport pick up, please feel free to contact us. Ada Bojana is a river island, formed at the mouth of the river Bojana in the Adriatic Sea. Ada Bojana is triangular shape, bordered from two sides by the Bojana river, and from the south, by the Adriatic sea. It is official naturist area, and very popular tourist destination. Taxi from Podgorica airport to Ada Bojana and Ulcinj is often request during the summer season. Ada Bojana has 3 kilometers long sandy beach, and according the "New York Times" in 2010th, it was in 10 top tourist destinations. Ulcinj, with his long sandy beach, is an excellent place for family vacation. During the ride from Podgorica airport to Ulcinj by taxi, you will pass across the national park Skadar Lake, through Sozina tunnel and via Sutomore and Bar. Book your transportation from airport Podgorica to Ulcinj Ada Bojana in advance, by our simple contact form, by phone call or SMS. You can also use popular applications Viber or WhatsApp for free communication with our English language speaking dispatcher. If you decide to use our taxi service, you will have new and comfortable taxi vehicle, higher class (only Mercedes E class, VW Passat or Touran), and professional taxi driver, who will give the best that your transfer from Podgorica airport to Ulcinj - Ada Bojana will exceed your expectations. Distance from Podgorica to Ulcinj is 80 kilometres, ride takes about 1h 20 min, and taxi from Podgorica airport to Ulcinj cost 55 eur (tunnel toll 5 euro is included in the price). This price is covering pick up at the airport, drop off in the city area, airport parking fee, and all travel costs. Please just pay attention that territory of the municipality is very big, and listed price is valid for the city zone. Quite often it happens that you book over the Internet accommodation in the city, and that you are actually a few miles away from civilization. Distance from Podgorica to Ada Bojana is 95 kilometers, ride takes about 1h 35 minutes. Taxi from airport Podgorica to Ada Bojana cost 65 euro and tunnel toll 5 euro is included in the price. Price is valid for a ride to hotel complex, and to complex of wooden houses on stilts, which are located on the river. One thing is very important if you are accommodated in one of that private houses. You must have a local phone number of the owner, or of the person who is competent for renting. 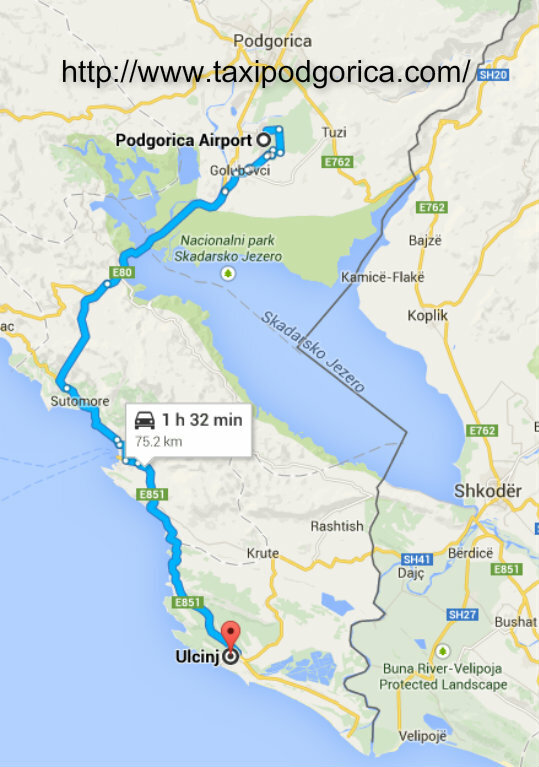 Please give it our Podgorica airport taxi driver before you reach Ulcinj or Ada BojanaI, he will call contact them. It is very difficult to find bungalows, because they are not marked by street name and number, we are mostly manage it according restaurants and similar points.